While technically the first day of Spring, anyone who's lived in the Pacific Northwest for any period of time knows that the season itself is quite a way off. So eventhough we've got a couple months of rain yet on the horizon, something to look forward to with the coming sun and warmer weather of May, June, and July is the beginning of the annual festival season! The first round of lineup announcements and ticket sales have begun for many of the most anticipated of the early summer offerings. Now in it's 16th year (how's that for crazy?) 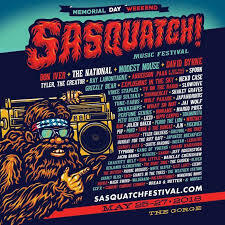 the biggest and most influential programming of course goes to Sasquatch! Music Festival at The Gorge Amphitheatre. This year's lineup including such massive names and store favorites as, TV on the Radio, Slowdive, Thundercat, JLIN, David Byrne, Bon Iver, The National, Modest Mouse, Tyler the Creator, Anderson Paak, Vince Staples, and Margo Price, to name just a few. Look through that lineup, it's wild how many notable acts are on it this year! A little bit later in the season, the annual Timber! Outdoor Music Festival comes along with a festival set against the backdrop of Carnation Washington's natural beauty. Every year the lineup includes some surprises, so keep an eye out when they announce this year's on KEXP next week. Another summer, sun and outdoor tradition here going on over 20 years, (begun in 1997! ), is the Capitol Hill Block Party. Previous years have seen some pretty wild programming coups, so it's always worth checking that lineup. This year's includes a set of store favorites like Father John Misty, Alvvays, Kelly Lee Owens, TR/ST, Bully, Great Grandpa, and Jamila Woods, among others. A newer festival just getting into the rhythm of it's second year is the Paul Allen-backed, Upstream Music Fest, with more than 200 artists in this year's lineup, there's almost bound to be something of interest in their KEXP-centric programming. Another store favorite, and (full disclosure) festival we sponsor here at the 'Boom, is the Northwest iteration of Terror Fest. Also in its second year, Terror Fest will return at the end of May with a solid lineup of sounds from the heavier end of the 21st century offshoots of dark folk, doom, sludge, melodic and black metal. Begun in 2013 by Dave Rodgers in a Southwest edition, the festival expanded last year to include a solidly programmed Northwest component. Hosted at Neumos, Barboza and The Highline over the course of the first weekend in June, this year's lineup includes particularly anticipated sets from Thou, Full of Hell, Necrot, Gatecreeper, Agoraphobic Nosebleed, Celeste, White Hills, Great Falls, and Emma Ruth Rundle. Just as the summer weather arrives and the sun is here to stay, we'll be descending into three nights of music spanning all things heavy, atmospheric and dark! Come join us.